This is a perfectly healthy and thriving tree. I don’t know how it happened. Was there more dirt around that tree that has washed away over time? Maybe lots of trees grow over and around rocks like this but we just can’t see it. Or is it somehow possible that there was a little seed that fell in a tiny dirt filled crack in this rock and then just grew and grew and grew? I’m sure I could google “trees growing over rocks” and find an actual scientific answer, but I’ve decided not to do that. Because I don’t think I need to know how it happens, as much as I need to know that this tree can seek out what it needs, even with that giant rock in its way. That it can thrive under conditions that don’t make a whole lot of sense to the causal observer. That it can quietly and slowly crawl across that obstacle, weave its roots into the ground and grow taller and taller. You know, that rock isn’t going anywhere– but neither is the tree. *I stumbled on this beautiful-ness on a recent visit to Grayson Highlands State Park— which is full of really amazing trails and the best little Visitors Center. Join my email list and be the first to know about new books and get exclusive access to my monthly newsletter where I share an inside look into the writer's life. 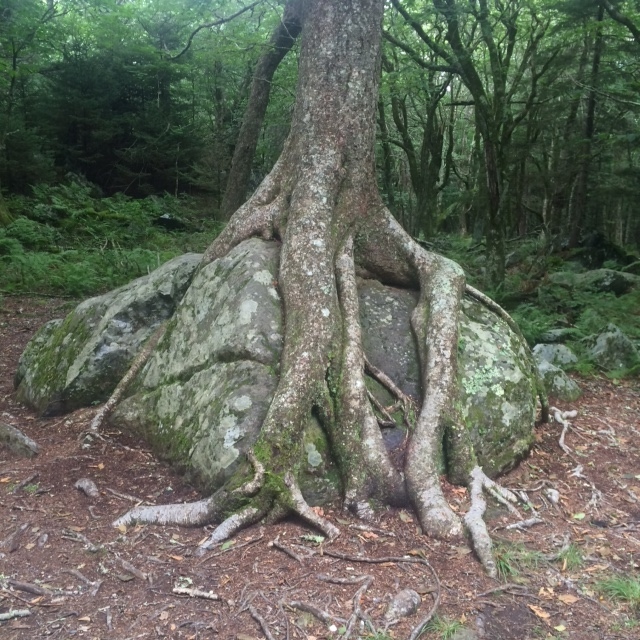 This entry was posted in Uncategorized and tagged allegory, Grayson Highlands State Park, hiking, lessons in nature, mountains, perserverance, persistence, rock, roots, southwest Virginia, steadfast, strength, suprises, trails, tree by marychrisescobar. Bookmark the permalink. Very interesting picture and tree. I recently finished reading the book Lab Girl, that might give you some insight into trees, at least after reading her book I don’t look at trees the same way. Thanks for your picture and your questions. It was so fascinating! It was just off the trail a little bit, and I was so grateful that I happened to glance left and see it. Lab Girl sounds really interesting. I love the way books can change the way we look at things!